President Muhammadu Buhari and his United States counterpart, Donald Trump, held a joint press conference in Washington D.C. today, addressing issues concerning the two countries. 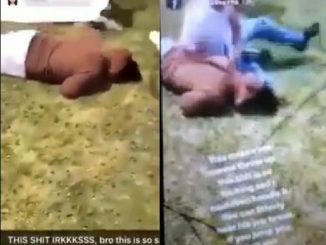 The US President frowned at the killing of Christians and Muslims in Nigeria, spoke on trade between the US and Nigeria, and said Nigeria is reputed as the “most beautiful country”. President Trump asked the President to halt the killing and persecution of Christians — and the killing of Muslims in the country. At the press conference, Trump asked President Buhari to support the United States bid to host the 2026 world cup. He said Canada and Mexico are also bidding to host the world cup in 2026. “Any help they could give us on that bid, we would appreciate,” Trump said. 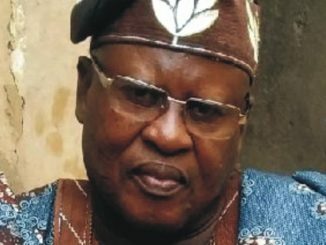 The US President also said Nigeria has a historical reputation for corruption, but President Buhari has been working to cut that down very substantially. 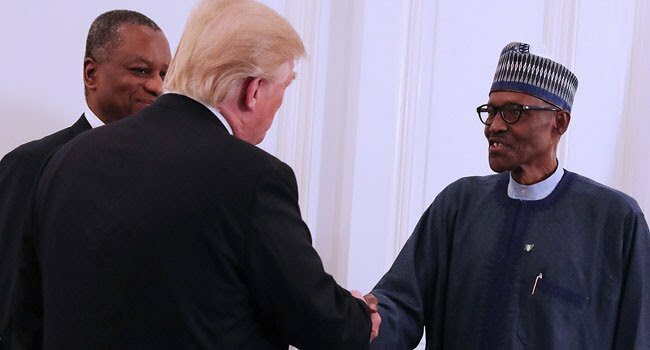 President Buhari, being the first president from sub-Saharan Africa to visit Trump after the US president was reported to have made vulgar comments about African countries, was asked if he discussed that. The Nigerian president said he is very careful about what the press says about him and other leaders, adding that he did not mention anything about the comments. President Buhari, while answering questions on US import of Nigerian crude, said he cannot tell the US what to do, but urged the country to invest in technological advancements that could make use of Nigeria’s oil. Trump said Nigeria has trade barriers in place against the United States, and said both countries are working on ripping down those trade barriers. “We give Nigeria well over $1 billion in trade every year, and we have already started talking with the president about taking down the trade barriers; very substantial barriers to the United States trade,” Trump said. 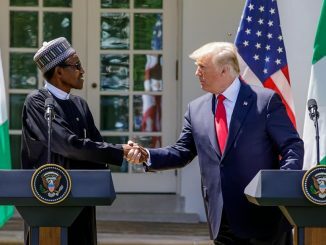 The US president added that Nigeria was interested in agricultural products from his country, stating that plans are now in place to allow export of US farm produce to Nigeria — for the good of US farmers, Nigeria, and Africa. When asked if he would visit Nigeria, Trump said was evasive, but added that he has heard that there is no country more beautiful than Nigeria.